Summer is finally here and I’ve been spending quite a bit of time outside in the great outdoors. I’ve discovered a new bird’s nest on the outside of the shop and this inspired the research of superstitions and folklore’s about bird’s nests. Without going into too much detail, I discovered that it’s good luck if you find a bird’s nest built on or near your home AND it’s even better luck if bird poop lands on your body!!!! Yes, it’s true, you read it here. 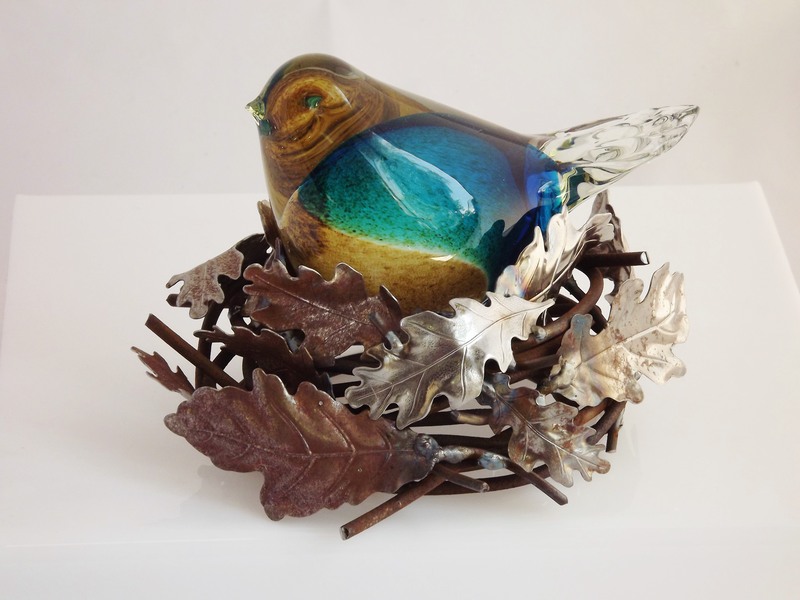 Moving onto the real point of this post, I came up with a home decor design of a glass bird in a metal bird’s nest. I thought this could be put outside in a garden during the summer and then inside on a mantle through the winter, bringing good luck year round.